Welcome to the sixth stop on the Virtual Book Tour for Mary Roach’s book. I loved the book. Mary manages to impart a lot of scientific knowledge while never quite losing her “holy crap, I’m sitting here with a dead guy” attitude. She’s very very funny, but never disrespectful. So many of the situations she finds herself in while researching the book are just inherently strange and therefore ready to be mined for black black humour. The difference is that when we’re alive, we expel that gas. The dead, lacking workable stomach muscles and sphincters and bedmates to annoy, do not. Cannot. So the gas builds up and the belly bloats. I ask Arpad why the gas wouldn’t just get forced out eventually. He explains that the small intestine has pretty much collapsed and sealed itself off. Or that there might be “something” blocking its egress. Though he allows, with some prodding, that a little bad air often does, in fact, slip out, and so, as a matter of record, it can be said that dead people fart. It needn’t be, but it can. As you can see, this is a great book. And even though fans of Six Feet Under might know a few of these things, there’s much more for them (us!) in here. The history of embalming, dissection, grave-robbing, human crash-test dummies; it’s all here. 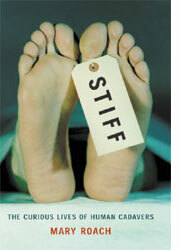 Stiff: The Curious Lives of Human Cadavers is not really about scatalogical humour, despite my choice of excerpt. It’s a funny and insightful book born out of the morbid curiosity about death that all of us share.